Item Number: H20-1806JD Have a question about this item? 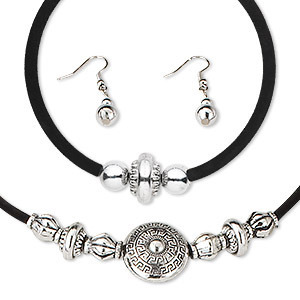 Contemporary necklace and bracelet feature silver-coated acrylic beads on an adjustable black-flocked memory wire and matching earrings on fishhook ear wire. Great for reselling opportunities and extending current jewelry lines. Colors, shapes and sizes may vary in each lot. 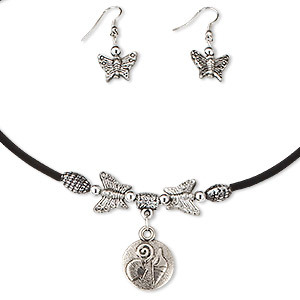 Necklace / earring / bracelet, steel / wood / antiqued "pewter" (zinc-based alloy), round, 19-inch necklace with 3-1/2 inch extender chain, fishhook ear wires, 7-1/2 inch bracelet with toggle clasp. Sold per set.